Just google for mobile technology advancement and mobile app market growth, and you will find ample of research studies, reports and statistics showcasing the facts about mobile future and the progress that it has made so far. There is no sign of mobilization of industries shutting down anytime and, there is nothing too surprising in it. That’s the reason, be it leading enterprises or SMBs, all have joined the mobile race to increase the customer outreach, improved selling of the services or products, and take the customer experience to a new level. But, most of them struggle at the first stage that’s to make the app out of the door as early as possible. In the competitive world, the delay in certain aspects as the timely release of the app affects the business adversely. Yes, it’s correct. Even, sometimes, in the hush of making the app to the app store or roll out the updates quickly, the compromise was made with the app quality, which is completely unacceptable and hinders the business growth as well. The traditional waterfall development methodology makes the development too long and the client’s needs are not properly addressed as just the final product is delivered to the client. Sometimes, it requires a hell lot of corrections. Here, agile development methodology creates a win-win situation for both developers and the clients as the complete project is divided into the multiple sprints, and every sprint is delivered fortnightly. In case of any changes, they can be done right away, instead of making them all together at the end. Agile development can easily accommodate the changing needs of the clients and add a great value to the app. Certainly, during client communication, all the team members are available, but it’s not essential that all of them are on the same page and have understood exactly what the app idea is or what a particular module ought to do. This way planning the development moves ahead will create a lot of chaos and misunderstanding, which in turn impacts the app quality and increase the time length as well. Creating wireframes- the low-fidelity mock-ups before starting the actual development is a good idea. The wireframe which can be created in a matter of hours showcase the functional abstract of the app, and thereby testing the user experience and implementing feedback becomes easier. With the prototype creation, both the development team and client travel on the same boat, which further makes the development journey smooth and time-efficient. Go to the old school technique of building a full-fledged application, launching it in the market and then updating it according to the user feedback works no more. It consumes very much time, efforts and dollars. The MVP (minimal viable product) approach is an excellent way to establish the app presence in the market in the minimum time and efforts. Later, as you harness the user input, keep updating the app and adding more functionalities to it and lead the path to healthy apps. This shift helps in getting the app into the hands of users quickly and with no guessing game, it can be built, adapt and change as per the user feedback swiftly. It speeds up the app development process. As the MVP process is picking up the pace in the market, the developers count just on the app store reviews to make updates in the app further. But, it’s a great mistake as the small set of users are providing their feedback and the information provided as feedback is often incomplete that extends the time needed to assess the user input and then make the changes. Although it doesn’t mean the user reviews can be overlooked while considering them along with analytics fuel up MVP process. Arming up the feedback with analytics helps in proactively finding out the challenges and then addressing them instantly. The system integration is a time-expensive process where the developers end up spending days to make the back-end data sources communicates for easy data access. It snatches away the time that developers can spend in crafting best user experience. This is where API strategy is a boon which enables the creation of mobile-optimized APIs on the fly and eases the data access. On a concluding note, the development team can shorten the development lifecycle and can invest more time and efforts in engineering WOW experience to the users. Testing is a key that ensures the launch of the flawless mobile application. To accommodate the needs of faster app development, automated testing is the finest test models that can be considered. The automated testing simultaneously runs a suite of testing processes over the code, identify the bugs (if any) and highlight them for the correction. The testing model is trustworthy, so the developers can rest assured during final delivery. When the businesses wanted to develop an app which runs impeccably on multiple devices and platforms, then pursuing cross-platform development leads the way. It can drastically reduce the efforts involved, dollars to spend, and not to forget the time. The hybrid app development companies code once and it works everywhere, and offer native-like experiences to the users, no matter what device or platform they are using. Embracing cross-platform approach results in improved time-to-market, which is a huge saving. Many times, what are intricacies the developers have to face and with what core features they have to struggle, come into the limelight when the project actually goes into the development. Well, no doubt the team is proficient enough to handle the issues, but getting entangled in the small elements or extra features eats up a lot of time and meeting the deadline becomes challenging. It’s better to outsource the parts of the app that works as add-ons so that final app can be released within the defined time frame and without any hassle. The app can be turned into a grand success only when it hits the mark at the right time. Here, both quality and time go hand in hand to better capitalize and gain major traction of the users. 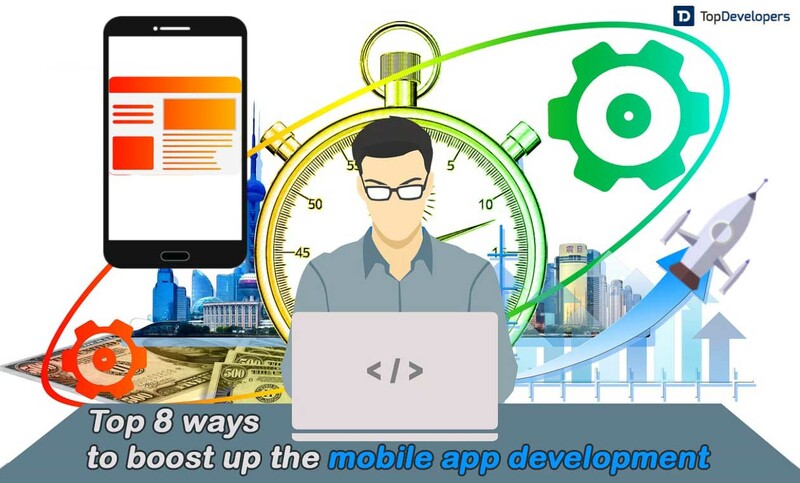 The aforementioned eight ways let the developers shorten the app development cycle and build the app at speed without making any compromise on quality. Give them a try to witness a great feat!